•	A full chicken or chicken chests depending on the available one. •	3 cups of dried and rubbed molokhia. •	5 mashed garlic cloves. •	1 tablespoon of margarine or butter. •	Clean the chicken well and wash it. •	Then put it in a pot on heat with the cinnamon stick and the laurel leaf until it become well- boiled with removing the grease from it from time to time. •	Put in another on heat pot molokhia and then put ghee on it and stir a little until it becomes well roasted. •	Then add garlic and coriander on molokhia and stir them well. 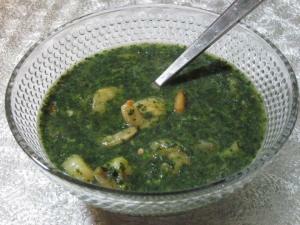 •	When the chicken becomes cooked, add the soup on molokhia. •	In this While, fragment chicken into pieces then add them on the molokhia pot until molokhia becomes solid on the aleppian way a little. •	Serve molokhia on the Aleppian way and beside it rice with vermicelli.